My kids love books. It is one of the things I am most proud of as a mom. I have been able to, so far, pass on my love for the written word, and this makes me incredibly happy. I catch my son reading like this often. I ❤ it! Although they are still young (almost 3 and 1) and are not reading yet I “catch” my son “reading” very often. He picks a book, sits down in one of his many reading spots and can stay there for fairly long stretches of time looking through the pages. My daughter seems to be following on his footsteps, as her favorite activity right now is taking every book off shelves as well as ripping pages off of books. Since becoming a mother I have read very little compared to how much I read before. I read a good amount of newspaper and magazine articles on-line, I also read parenting and food blogs, but I have read just two books since my son was born, one of them was a parenting book. However, I have enjoyed reading novels for many years, and as my children grow I look forward to reading more. 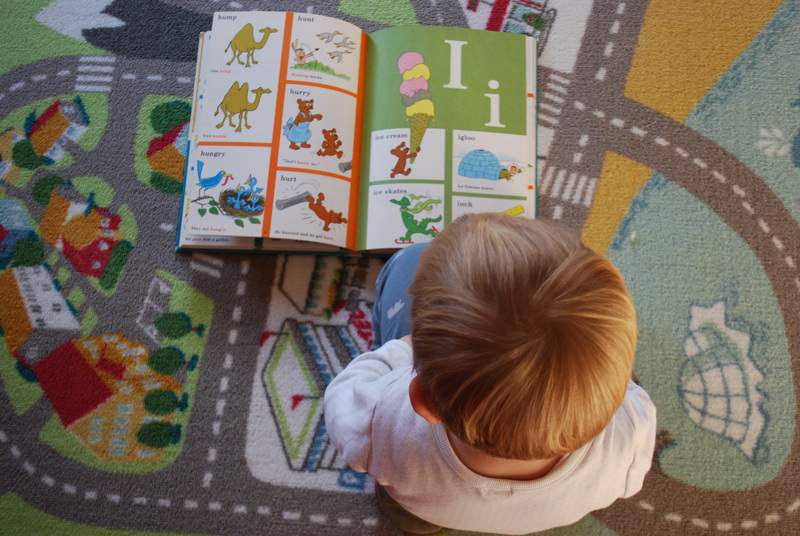 Read every night: Our bedtime routine includes reading three books. Sometimes I am really tired and don’t want to do it, but I do anyway. Keep it a positive experience: Even when my kids don’t want to sit and listen I read, but I never force them to sit down or get upset about their lack of attention. They can play while I read. They are hearing the words and that is fine with me. Books are everywhere: We have books in their room, in the playroom and in the living room. They are easy to reach and no book of theirs is off-limits. This sometimes means that I find books with ripped pages, but I am OK with this. I do tell them that books need to be taken care of, but I don’t want them to be afraid to handle them. Comfy reading spots: We started reading while sitting on a rocker, and now that we’ve transitioned my son to a bed we read on it at night. 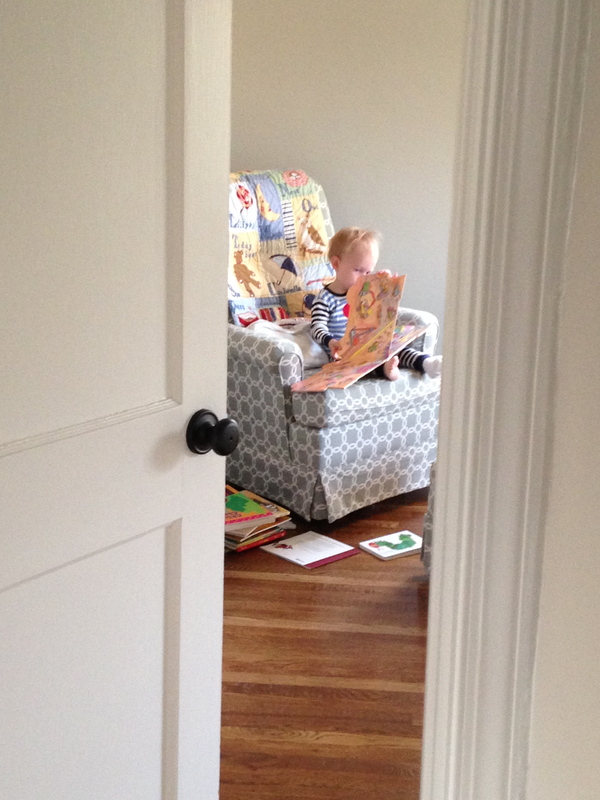 In the playroom there is a dedicated reading nook where I often find him reading. Time at the library: We go to Story Time at the library almost every week, and almost every week we check out new books to bring home. We read all the time: Although we read every night, we also read before nap time and during the day whenever we feel like it. Our family also knows of the importance of books, and they give us books as gifts often. My mother-in-law also reads to my son via Skype. She did this once and he loved it so much she now has to have books around every time we call her because he asks her to read to him. What I am not yet doing, but I know I need to, is read books in front of my children so they see that reading is important and fun through our entire life. I am not quite there yet, but I hope to be soon. Do your kids love to read? Did you do something to foster this? dang my post got mangled on the upload- meant to say she’s “9 yrs old and reading on a 9th grade level”. Amazing Adam! Before I had kids I would sit in the same place reading for hours. I miss that, but love seeing my kids “read”. Love your little readers. both of my daughters were “reading” the same way by 1- we’d catch our older one scanning the words in books and holding, turning pages, front-to-back at found her sitting in her crib, at maybe 15 months, middle of the night, “reading” by the light of one of her crib toys. She’s 9 now grade level; she will sit for hours and read, and it’s one of “proudest dad” things with her. I’m the same way, so her mom will leave us in the morning if she’s working at 8,9 am and come back at 5 PM to us in the same spot with a pile of books. Now our 15 month old is doing the same- she loves sitting next to us and “reading” her sister and dad’s books, and her own, as we all sink deep into our books. I think this is one of the most important tools you can give your kids to jump-start their schooling/education early. Erin is not great at math- but she excels in writing, reading, any type of spelling/vocabulary stuff- and we didn’t focus on math until she got to school. My three year old and I love reading. It is also an everyday ritual as well as a common frame of reference. We talk about the themes and stories parallel to our own experiences. Theodor has just grasped the concept of authors. I like the idea of talking about themes and how they parallel your experiences. I guess we’ve done that a little bit when I have bought books specifically for their theme, like potty training or bringing a new baby home, but I have yet to do for just general life. Great idea. Thanks for sharing. I love reading such an important part of early learning. You can get so much from a book I have shelves full of books. We also have stories and reading apps on the iPad I’m sure that these have helped fostered my 3yo love of reading she is very good at phonics and has incredible letter recognition! My son is very verbal- I think it has too do with all the reading we do around here. Thanks for reading! Our bedtime routine is: bath, brushing teeth, reading, prayer, song and bedtime. My son now likes to stay up looking at books for a bit longer. I turn off his light usually after 10 minutes, by then he is almost always asleep. Thanks for reading! I love receiving and giving books. One of my favorite baby showers was a book-themed one. Everyone had to bring books to give to the new parents.